The pretzels I made had enough flavour to be satisfying on their own but when paired with a white cheddar, garlic, and rosemary sauce they were impossible to put down. This sauce was pretty heavy on the garlic so I would skip it as a first date appetizer. It took about 10mins to make and no effort other than grating the cheese. It is a pretty classic method to get a smooth rich sauce. You start by making a roux, (flour and fat/butter), to thicken the sauce and incorporate milk and cheese for flavour. We ate half of it on the pretzels and used the leftovers on broccoli a couple days later. Blend the garlic pepper and rosemary in a food processor. Melt butter and add blended ingredients. Cook on low for a couple minutes to soften the garlic. Remove from heat and stir in flour and salt. Gradually add milk, stirring until well mixed. Cook over low heat, stirring constantly, until thickened and smooth. Cook for 5 minutes longer; add cheese. I have made pretzels on the blog before: Everything Pretzels and they were great but did not have that golden crust that I crave. Last Friday I met up with some friends and got stuck in a bar due to torrential rain. I worked up a healthy hangover for Saturday and woke up needing a good dose of warm soft pretzels. I was not disappointed and think these were the best thing I have ever baked. Boiling them for 30 seconds in baking soda elevated them to the pinnacle of carb goodness. I also made a hot cheese sauce to dunk them in and will get that post up soon. Combine the water, sugar and yeast in the bowl of a stand mixer. Allow to sit until the mixture begins to foam. Add the flour, sea salt and butter. Using the dough hook attachment, mix on low speed until well combined. Remove the dough from the bowl then oil it well with some canola oil. Return the dough to the bowl, cover with plastic wrap and let it sit until the dough has doubled in size. Preheat the oven to 450 degrees F. Line 2 cookie sheets with parchment paper and lightly brush with the canola oil. Divide the dough into 8 equal pieces. Roll out each piece of dough into a 24-inch rope. Form the shape of a pretzel. Place onto the parchment-lined cookie sheet. Place the pretzels into the boiling water, 1 by 1, for 30 seconds. Return them to the sheet. Brush the top of each pretzel with the beaten egg and water mixture and sprinkle with the pretzel salt, sesame seeds, and poppy seeds. Bake until golden brown in color, approximately 12 to 14 minutes. I have been pretty swamped lately between weddings, vacation, and the pending arrival of our first child so I haven't had much time to update the blog. I am still cooking just backlogged getting posts up. Here is my second attempt at fresh sausage. It was even better than the first and didn't take more than a couple hours to get some great homemade sausage. I am looking forward getting my own BBQ soon so that I can smoke sausage as well as continuing the fresh sausages. So far it has been worth the effort. Brush the garlic and peppers in olive oil. Roast them until the skin starts to darken. Allow to cool then peel the skin off the peppers. Add the meat to the hopper and put the casing on a 3/4 inch stuffing tube. Meringue based desserts are hugely popular in New Zealand and Australia. Their national dessert is Pavlova and the battle over who invented it was so hotly contested that an international court was involved eventually deciding in New Zealand's favour. Another popular treat is the Macaron. 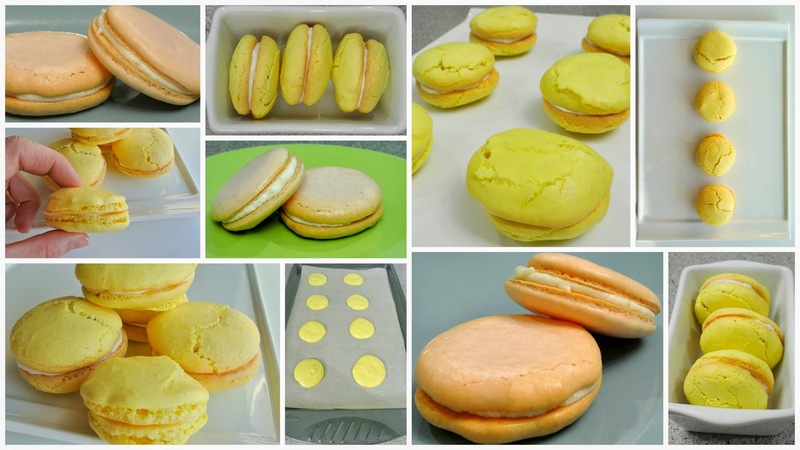 The Macaron is basically a butter cream icing between two meringue cookies. They have become more available after being in the spotlight on Australia's "MasterChef" TV series. We watched MasterChef when we lived in NZ and when we moved in with our roommates in AUS they took us out to a live MasterChef meet and greet where one the finalists of the season made Macaron's. There is some speculation about where they actually originated showing up in Switzerland and France but potentially by Italians. They come in every flavour you could imagine. Jess and I decided to try and make a lemon version with a lemon butter cream. We had to play around with the proportions and ended up with perfect flavour, but we will still have to work at improving our recipe until we get smooth cookie tops with nice feet, (the bubbly ruffle at the bottom). I think I might have to crack and get a scale for the ingredients and should probably use a pastry bag instead of cutting off the corner of a Ziploc sandwich bag. Combine egg whites and sugar into the bowl of an electric mixer and whip egg until stiff peaks form (about 10 min). Adding the food coloring during the last minute. Add the dry mixture into the egg whites. Using a spatula, smash dry ingredient into the egg white, flattening mixture. Then fold mixture onto itself until it becomes shiny (max 50 folds). Transfer the batter to a large piping bag and pipe onto the baking sheets. Slam the baking tray onto the counter 5 to 10 times to get the air bubbles out of the them. Let them sit for 30 mins. Remove the sheet from the oven & place it on a cooling rack, allowing the cookies to cool before removing them. Beat the butter on medium-high speed for 2 minutes. Add the powdered sugar, half cup at a time until combined. Add lemon juice, zest, vanilla & salt, continue to beat on medium for another 1-2 minutes.